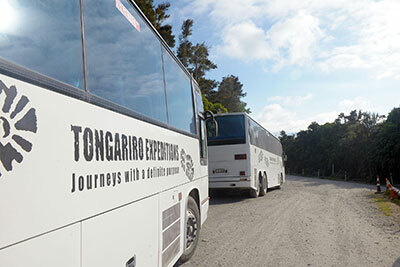 BOOK YOUR TONGARIRO ADVENTURE TODAY! Different situations may cause us to change our pick up times. You must call the day before you are scheduled to go to check the weather and the pickup times. You must wait outside your pick up location at least 10 minutes before pick up time so that you do not miss the bus. If you are not picked up on time call us straight away to ensure that we can assist. Waiting 5 minutes after pick up time is too late. The drivers arrive at Ketetahi at 2.00pm and start checking people in. Please approach the drivers once you complete the track to check in. Once you are checked in you are then put on the next bus leaving. The last bus leaves at 4:00pm. You must be off the track by 4.00pm. Summer vs Winter The most popular way to enjoy the Tongariro Alpine Crossing in Summer is to self-guide and use our transport only options. Guides can be arranged on request. During the Winter months, when there is snow and ice on the track we offer track safety options. If you have booked a Tongariro Crossing transport only option and the track conditions change, you will be offered a full refund or the option to upgrade. The same with the end of the Winter season. If the track conditions clear we will offer you a partial refund to go on our transport only options or a full refund if you choose to not go ahead. Taupo is set beside the northern end of Lake Taupo with stunning views of the lake and mountains. It is the largest town we pick up from and there is plenty to do in and around the town. We pick up from your accommodation if it is central or from the Taupo i-SITE if you are out of our pick up route. Turangi is set beside the Tongariro River. Famous for fly fishing. It is a smaller town closer to the mountain. We pick up from your accommodation if it is central or from the Turangi i-SITE if you are out of our pick up route. Ketetahi one way shuttle. This is the easiest and most convenient service for hiking the track. First thing in the morning, park your vehicle at the end of the track in the private car park at Ketetahi (Tongariro shuttle car park), then our shuttle will take you to the start of the track, when you have finished your hike your car is there so no need to catch a bus at the end of the day, you can take as long or as short amount of time to do the hike. Please note: as of October 2018 there is a parking time limit of 4 hours at the Ketetahi and Mangatepopo Public Car Parks. So if you are wanting the Ketetahi one way shuttle you must now park at the private Tongariro Shuttle Car Park. This way you can park safely all day. Northern Circuit If you are doing the Northern Circuit or require specialised one way transfers please call and we will do our best to accommodate.